Published shortly after 1962, this 9″x12″ unpaginated book was wholly a product of Kingsport. Paper by Mead, binding fabrics by Holliston Mills, and with typography, printing and binding by Kingsport Press. It was authored by Ben Haden and designed by J. Fred Wright. The Kingsport Rotary Club has been a major force in keeping a published record of Kingsport as it grew. Their first 4.5″x7″ book “Kingsport Tennessee City of Industry Schools Churches Homes” (green cover) was published in 1937. 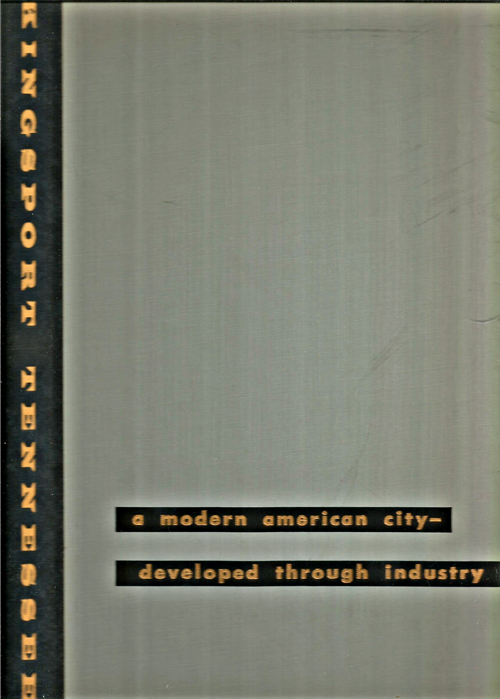 The second book “Kingsport Tennessee The Planned Industrial City” (blue cover) came out in 1946. In my opinion, the best book about Kingsport’s history is Margaret Ripley Wolfe’s “Kingsport Tennessee A Planned American City” (1987, University of Kentucky Press). It can be a trifle arid at times, but she writes well and handles the material in good order. Lest I forget: “KINGSPORT A Romance of Industry” by Howard Long, came out in 1928. Published by The Sevier Press, Kingsport, Tennessee, it’s not a scholarly piece, but is worth reading, if only for the sense of optimism that prevailed in these few years preceding the Great Depression. This entry was posted in Kingsport TN ephemera and tagged Bill Freehoff, Charlie Deming, Holston Valley Broadcasting, Howard Long, Kingsport A Romance of Industry, Kingsport Rotary Club, Kingsport Tennessee A Planned American City, Kingsport Times-News, Margaret Ripley Wolfe, WKPT-AM on October 18, 2015 by Bob Lawrence.